This summer, a Sunday School class at my local church in Seattle has read through nine books in the Faultlines series by Abingdon Press. It was a substantial romp through varied perspectives on the current reality of The United Methodist Church. In the process of study, the class discovered at least three misleading claims in the book Are We Really Better Together? An Evangelical Perspective on the Division in the UMC by Revs. Rob Renfroe (Good News Movement President) and Walter Fenton (Former Good News Movement staff, now staff with the Wesleyan Covenant Association), both writing from Woodlands, Texas. I claim them below as my own, though not all were initially been detailed by me. 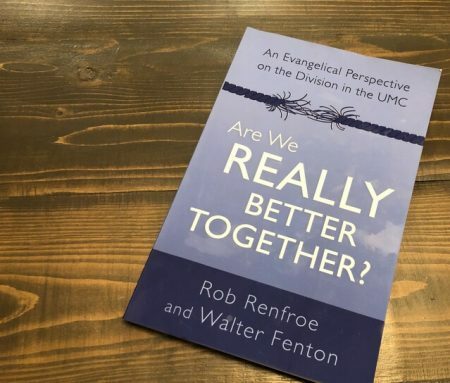 Claim: Renfroe/Fenton claim the UMC’s positions on sexual ethics, marriage, and ordination standards are in line (“not substantially different”) with the vast majority of Christianity. Perspective: The above claim is part of their assertion that the UMC’s prohibition on LGBTQ inclusion is in line with the rest of Christendom and if we shift our position, then we will find ourselves outside of the rest of Christendom. But there’s a pretty big difference: The United Methodist Church ordains women. The Roman Catholic Church does not. The Eastern Orthodox does not. And the vast majority of Protestantism does not. Of the top 5 largest Christian denominations in America, only United Methodism ordains women. So in short, The UMC is already “substantially different” from the vast majority of Christendom on its ordination standards because we include women. Changing our ordination standards to remove the prohibition on partnered LGBTQ persons will not change our standing with these groups who already consider our clergywomen, and our ordination standards, to be “substantially different” and outside of their historical position. Thus it is a misleading claim that we are in-line with these traditions (“not substantially different”) when on a critical ordination standard, we clearly are. Incidentally, when the ACNA broke from The Episcopal Church over their change in ordination standard to consecrate a gay Bishop and allow partnered clergy, they simultaneously ceased the ordination of women and the election of female bishops, the latter of which is still practiced. Similarly, if the WCA breaks from The United Methodist Church, removal of the ordination of women is the only thing left to put them back to be in-line with the Christian traditions that Renfroe/Fenton admire. Claim: Renroe/Fenton claim the incompatibility statement was carefully crafted and that such effort and wisdom means it should be retained. Perspective: South Carolina’s Tom Summers wrote a two-part historical narrative (1) (2) on the origin of this very phrase “incompatible with Christian teaching.” In it, he found that the original statement that was discerned by a study committee over four years, and refined in the committee process at General Conference, lacked that particular phrase. Instead, the phrase was added on the floor, hastily written by people outside of the committee process. Since then, votes to remove the incompatibility clause have ranged from 58-42 to 52-48 percent, failing by a few dozen votes out of just under 1000. Homosexuals no less than heterosexuals are persons of sacred worth, who need the ministry and guidance of the church in their struggles for human fulfillment, as well as the spiritual and emotional care of a fellowship which enables reconciling relationships with God, with others and with themselves. Further we insist that all persons are entitled to have their human and civil rights insured, though we do not condone the practice of homosexuality and consider this practice incompatible with Christian teaching. So the pastoral care statement was “carefully crafted” over four years in an official committee. But the bolded addition, lifted up by Renfroe/Genton, was not as carefully crafted and formed the basis of further discrimination against LGBTQ people. A populist appeal to fear (this was the early 1970s, the age of Anita Bryant, remember?) is no substitute for careful craftsmanship, and the claim that phrase was “carefully crafted” is not historically accurate. Claim: Renfroe/Fenton claim that minds are made up and there is no more to be gained by further conversation. Perspective: The dominant side of the debate for centuries has been the Traditionalist position of denying marriage ceremonies to gays and lesbians, and forcing gays and lesbians to divorce their same-gender partners before they could be ordained as clergy. If votes were taken at the beginning of Methodism, it would be unanimous. But over the recent decades, and especially since 2003, marriage equality and LGBTQ civil protections have increased, and the number of United Methodist laity and clergy who have changed their minds are substantial. Every advocate for LGBTQ inclusion has stories of changed hearts and minds. Every LGBTQ person has changed the heart and mind of someone close to them. So decades of conversation have resulted in changed minds, and they have primarily come from Traditionalists changing their minds. So it seems that the changed minds and new insights have all resulted in attrition from the Traditionalist position. Little wonder Renfroe/Fenton would like the conversations to end. But to claim that such conversations don’t result in new insights or changed minds is misleading. The 52/48 percent votes at General Conference indicate that conversation substantially changes minds and produces new insights for people. It’s just not the insights or the change that the authors hope for. Charitably, one would hope outrageous claims in the first chapter to be substantiated in follow up chapters or footnotes. Not so. The rest of the book does not substantiate or expound on the above claims. It has an extensive debate with imaginary opponents’ arguments for LGBTQ inclusion, and a cursory biblical examination of the Scripture passages that they claim are against LGBTQ persons. The ~100-page book ends with a claim that The UMC is not worth maintaining and that it should be divided or dissolved. So the claims stand alone. Renfroe/Fenton claim that their side has the legitimacy of ordination standards in line with the vast majority of Christendom, a carefully crafted polity, and that minds are not being changed. The above commentary shows that such claims are misleading, at best, and distort our history in multiple places. While I personally find fault with their interpretation of Scripture and the lines of arguments against imaginary opponents, such are differences in opinion. The above commentary name differences in fact and such differences bear mention to make sure the average United Methodist isn’t taken by misleading claims.